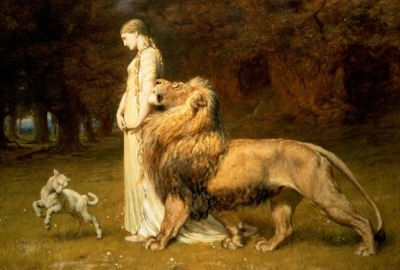 Briton Riviere, "Una and the Lion"
I experienced that old saw about March coming in like a lion, and going out like a lamb, in the space of a single week. Week six of training for Old Gabe brought more climbing in the snow. My toes were frozen for about the first mile and a half, but managed to warm up (and actually feel pretty comfortable) getting two Towers ascents done, for about 3,500 feet of climbing in a little under 15 miles. Not super technical -- it was Towers, after all -- but it felt good to push through and get lots of climbing done, despite a little sliding around in the snow. Week seven could not have been more different! Despite snow earlier in the week, the day brought blue skies, sunshine, and temperatures in the 60s. I actually got sunburned. Again, I kept things simple and just stuck to Towers road, but it felt good to get 19 miles in, and almost 5,000 feet of climbing. I was definitely tired by the end, but after a few weeks of building distance and vertical feet, it is satisfying to feel the strength coming back into my legs. After a few weeks of building in distance and elevation gain, next week's long run will be a recovery run (2 or 3 hrs max). I'm excited to let my body consolidate those gains, and go long again on March 17. Enjoy the sunshine, friends, and see you on the trail!